Jack, Will, and Alana all return to the moment that they died and came back to life by Hannibal’s hand. Jack literally died, his heart must have stopped, but everyone’s lives were metaphorically over the second they saw Hannibal’s true self that rainy night. Like a baptism in blood, they were reborn, and their lives now are split into BC (Before Cannibal) and AD (After Death). Religion pops up over and over again this season — in just this episode, Mason Verger asks Alana if she has accepted Jesus and Jack visits a church during Bella’s funeral — but these characters subscribe only to the religion of Hannibal. Alana claims she doesn’t need religion (she can appreciate Old Testament revenge just fine on her own, thank you very much), but even she isn’t immune to the cult of Hannibal. They study him, live and die by him, and right now they are all devoted to him in some way or another. Dr. Frederick Chilton makes his triumphant return in this episode and looks only a little worse for wear. That is, until he takes off his makeup and removes his false teeth to show Mason Verger his real scars. They are all scarred now, but only Mason’s and Frederick’s scars are so openly visible. Everyone else can hide their scars with clothes or a smile. Alana’s new AD self is setting the stage for something BC Alana would never have agreed to: revenge. She is manipulating and pulling strings and doing what she needs to do to get Hannibal caught. And that means sending Will back toward the monster himself. Old Alana would know that’s not healthy and would want to protect him, but new Alana only wants Hannibal, and she’ll play by his rules to get what she wants. I love this direction for Alana. Her clothes are brighter, but her soul is darker, and it makes so much sense. 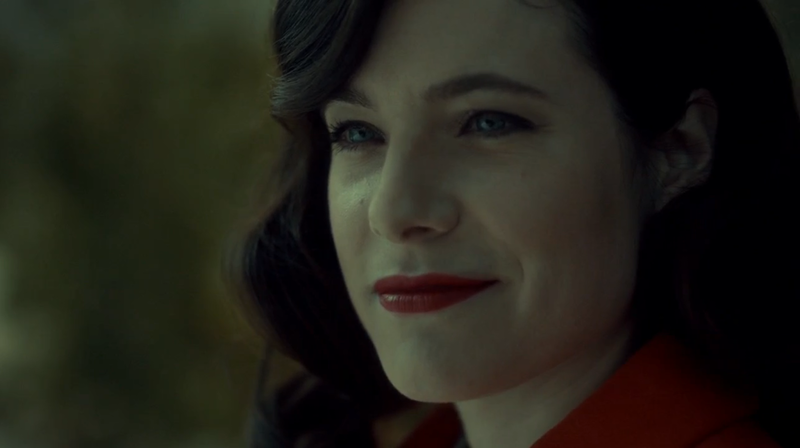 When she didn’t see Hannibal for what he was, she was a pawn that got in the way of Will and Jack’s plans. But that old self shattered when her bones did, and this Alana will be no one’s pawn. With her pale skin, dark hair, and red lips, she looks like a porcelain doll, but she isn’t fragile anymore. While most of the characters returned to the moment they metaphorically died, Bella actually did die, from the cancer she’s had since season one. Her cancer mirrors Hannibal’s path. Once hidden and lurking, it’s progressed at the same time the truth about Hannibal spread to everyone’s consciousness and finally took over. I kept wondering where Jack and Bella’s family and friends were when she was dying, or where they were during the funeral. But that they never appear gives a feeling that these characters are all alone in the world, and that the world revolves entirely around Hannibal. Instead of loved ones at Bella’s funeral, there was only Will and a card from Hannibal himself. They are all irreparably isolated, and the only other people in their lives are people who are also circling closer and closer to Hannibal. Bella’s scenes with Jack were touching. Even after she died, Jack imagined Bella, dressed in white, healthy, and looking at him lovingly. He wasn’t the only one to imagine loved ones as he wished they were. Will imagined dinner with Hannibal and what might have been if he had chosen the life of running away with him instead of running after him. As usual, it’s hard to tell what’s real and what isn’t, and it’s like Will’s imagination has run out on him and taken over the whole show. The scenes with Margot and Mason don’t include dream imagery, perhaps because Mason is nightmarish enough on his own. Mason and Frederick deconstructed their faces, and Mason went through a surgery that exposed his jawbone and made him look like a skeleton, and as far as I could tell, that was all in real life. (Yup, that’s nightmarish enough for me.) Mason has never been very subtle and he tends to say whatever he’s thinking, so it doesn’t seem like he has a rich interior life for his imagination. I’m happy to see the Vergers again — mostly Margot, let’s be real. Earlier this week NBC announced they wouldn’t be renewing Hannibal for season four. There’s a chance someone else like Amazon or another channel could pick it up, and I’m keeping my fingers crossed. But either way, I’ll be here every week for the remaining episodes, enjoying every disgusting, beautiful moment. Aperitivo is a drink to stimulate the appetite, generally an alcoholic drink served before a meal. Like pre-gaming, kind of. The scene where Will imagines what would have happened if he killed Jack with Hannibal was like a ballet. Their moves were graceful and coordinated, and the music was beautiful. I love that Alana finally interacted with Margot. It’s about time the Hannibal women had some scenes together. I´m so agree with you about the way Alana is now, i love her! I undertand very well why is so angry. With the first three episodes i was a little upset because everyone was missing Hannibal but no one was mad about what he did. Alana is ready for revenge, and i think the show need that, one character looking for Hannibal, but no for redemtion. Laurence Fishburne was amazing in this episode, he´s my MVP. He was so emotional, and heartbreak. He has lost the love of his life, and the talk with Will in the church was beautiful. I miss very much in this episode Bedelia and Hannibal. I need them back. I´m so sorry for my english ( i´m always saying that, but is the truth that i will love to do it better) but I really really aprecciate your reviews, especially now that Hannibal has been canceled. I refuse to believe we not going to have another season. I sitt believe they going to save the show. It´s the best. And Mads Mikkelsen job is awesome. Your comment is so great, thank you! I agree, Laurence Fishburne was amaaaazing, he's so good. I love every scene with him and his wife. I am so hopeful that someone will pick it up and we will have a season four!